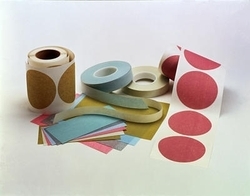 Aluminum Oxide particles coated on a flexible nonwoven backing for finishing and polishing contoured surfaces of softer materials such as plastics, aluminum, brass and copper. PSA backed discs and sheets are available in 2.0, 3.0 and 9.0 micron grades. This product has a 12 calendar day lead time before it ships from 3M.